D2298, as preserved at the Buckinghamshire Railway Centre. The British Rail Class 04 0-6-0 diesel-mechanical shunting locomotive class was built between 1952 and 1962. 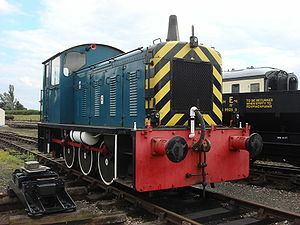 It was the basis for the later Class 03 built in the British Railways workshops. The Class 04 locomotives were supplied by the Drewry Car Co., which at the time (and for most of its existence) had no manufacturing capability. Drewry sub-contracted the construction work to two builders. Both of these built other locomotives under the same arrangement. Early locomotives were built by Vulcan Foundry and later examples were built by Robert Stephenson and Hawthorns. This page was last changed on 10 March 2013, at 00:03.